I was watching Playschool this morning with Tiernan and Molly, and noticed that Sofya, a presenter who is hearing-impaired and who presents with sign language, as well as with spoken English, appears to have finally been given the status of a full presenter. I’ve seen Sofya on the show many times over the last few years, but she is usually there as third person, almost in a guest-presenter role. It was nice to see her given equal status with Jay this morning. Sofya performed more rhymes and songs than she normally does, and I found her very entertaining. She did a great job. 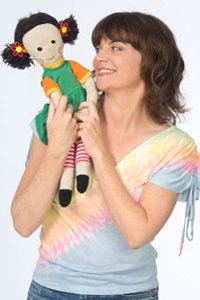 I briefly checked out the Playschool page of the ABC website (see here for Sofya’s profile, where the above image came from), and learnt that Sofya is a professionally trained actor with loads of experience. I wonder why it has taken this long to see her as a full presenter on Playschool? Anyway, keep up the good work, Sofya. This is the story of Molly’s birth, continued on from here. Thinking back, I am realising that some of the details of Molly’s early days are pretty sketchy. I wish I had kept a journal of our experiences. 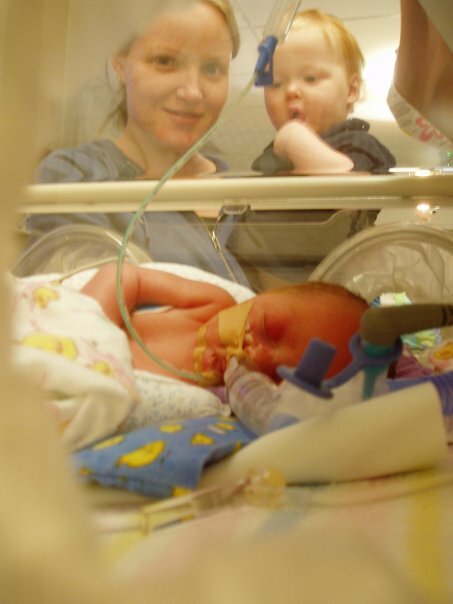 For a great account of what life on the NICU is like, visit ‘Mike and Ollie’. Little Isaac and Molly were born at 25 weeks’ gestation, in 1992, and, against the odds, they are happy, healthy 19-year-olds today. Their Mum kept a journal of their time in hospital, and beyond, and reading it has brought back a flood of memories – the sights and smells of the NICU, the anguish of being separated from a newborn, the constant fear and worry. However, I have to stress that, since these two little ones were born much more prematurely than my little Molly, they were much sicker than she ever was. Even though our NICU journey was a traumatic and very challenging period of our lives, our Molly’s life was never in danger, the way their’s was. Our journey was pretty much smooth sailing, over in six-and-a-half weeks. Being buzzed into the NICU (Neonatal Intensive Care Unit) for the first time felt like being admitted into some sort of top-secret club for guilty parents. Maybe not everyone felt this way, but for the first few days (weeks, even) of Molly’s life, all I felt was sad and guilty. It was not a welcoming atmosphere, which was not the staff’s fault – everyone we met in our short time at Westmead NICU was warm and lovely – but the sterility and the silence of the place were quite unnerving. We were led into a semi-lit room, occupied by two humidicribs, several nurses and lots of equipment. Equipment that beeped and flashed different hues, monitors that showed squiggly lines and colour-coded numbers, and tanks and tubes that hissed and gurgled. We were instructed to wash our hands and arms (with both soap and anti-bacterial gel), and then we got to see her. I was actually quite surprised at how perfect she was. I knew she would be small, but to me she was beautiful and quite ‘normal’ looking. Now I recognise the look of a premature baby – their eyes tend to be a bit bulgey for several months (depending on how early they are), and their faces are a bit more angular, until they build up more fat reserves. But I didn’t see any of this – all I saw was my beautiful daughter. 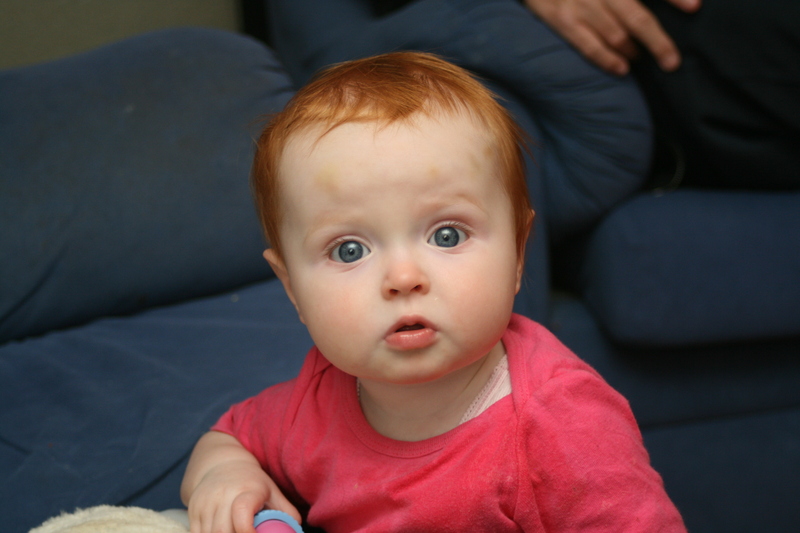 She looked a lot like Tiernan as a newborn, only smaller and more delicate. It was a little bit of a guess, though, with all of the tubes and lines coming from her body and getting in the way. It was all very overwhelming. We were only allowed to touch her through the hand-holes in the sides of the humidicrib. I cried as I stroked her hair and her delicate skin. I remember marvelling at her golden hair, with the same metallic sheen that most newborns seem to have. Her head could have fit neatly in the palm of my hand, like a grapefruit. It was tiny. 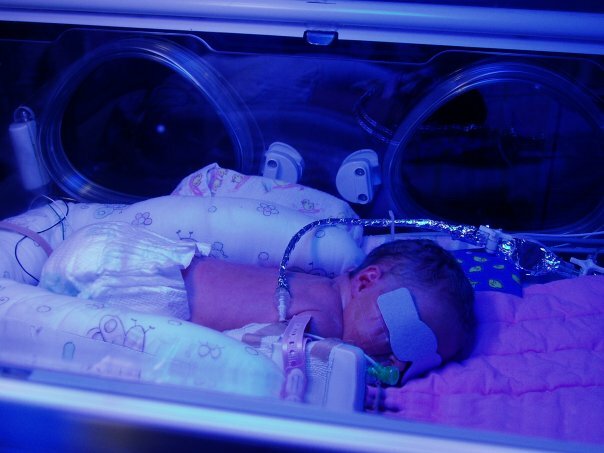 When we were ready, the NICU nurses explained what each bit of equipment was for. Although Molly was breathing (and crying, even) when she was born, and did not require resuscitation, the paediatric team put her on CPAP (Continuous Positive Airway Pressure), which helped to deliver extra oxygen to her lungs without actually breathing for her. 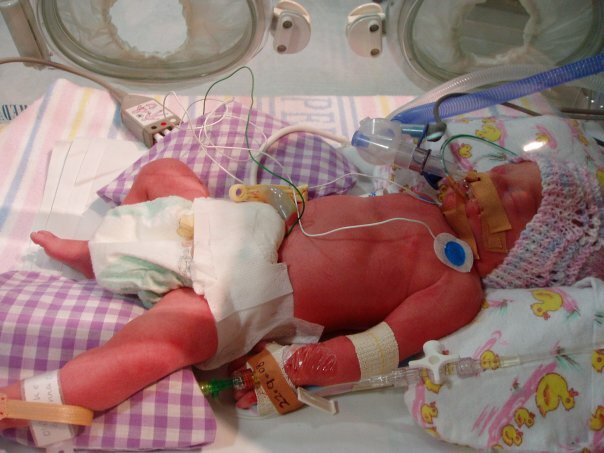 At the same time, she was given artificial surfactant, which is a substance that helps the lungs to stay inflated, and which premature babies do not make on their own. Hopefully, the doses of steroids I had been given days earlier would be enough to help Molly’s lungs mature that little bit faster, and she would not require help with her breathing for long. CPAP was the least-invasive method of helping Molly to breathe, and the doctors were just waiting to see whether it would be enough – the next step was full intubation and ventilation, which does have some risks. At the moment, Molly was comfortable enough. There were other lines coming from Molly’s body that were monitoring her heart rate and her blood-oxygen level (saturation). She had a cannula in her little arm, with a drip supplying nutrients, and I think a prophylactic dose of antibiotics, as infections picked up in the hospital environment are the biggest risk to otherwise ‘healthy’ premature babies. At the moment, the team were mostly interested in getting Molly stable and comfortable. She had no clothes on, and the temperature in the humidicrib was turned right up because, with no stores of fat to provide insulation, Molly had no ability to maintain her core temperature. I don’t remember meeting any doctors straight away, but Molly’s nurses were lovely, reassuring, confident and sensitive at this scary and emotionally draining time for us. They made us feel welcome, encouraged us to ask millions of questions (which we did), supplied additional information when we didn’t know what to ask, and let us know that we could come and visit our baby any time, night or day. Visitors were limited to only immediate family members, and only two at a time. Molly’s Grandparents, Aunts, Uncles and cousin came to visit her often in those first few days, and their support meant so much to us, particularly those who shared care of Tiernan for us. I was encouraged to express breast milk for Molly. I was given a Polaroid photo that showed all of her face, without all of the tubes and tape. It was to help me ‘think baby thoughts’ when it was time to express colostrum (and later, milk) for her. At first, I was bringing tiny amounts of colostrum (like, 1-2 ml at a time) down to the nurses and bashfully handing it over, saying, “Sorry it’s not much.” They chuckled and let me know that she wouldn’t be taking anything for the first 24 hours, and even then they would have to be very careful – only giving her about 1ml every second hour, and seeing how she tolerated it. After a few hours on CPAP, it became clear that Molly needed a little more help, so they intubated her. We were told there would be some risk to Molly’s eyesight and brain function as a result, but hopefully she would not need to be ventilated for long, which would minimise the risk. As it turns out, she was only ventilated for 12 hours before being weaned onto CPAP once again, and after only another day, she was breathing with no assistance at all. It is utterly amazing to me what such a tiny, tiny human body is capable of. On day three, I got to hold her. Mum was with me, and she cried with me as I held Molly against my skin for the first time. I longed so much to absorb Molly back into my body, where she still belonged. I never wanted to let her go again. It was exquisitely painful. Yet, I was so relieved that she was healthy and safe. Molly knew it was me, too. While I was holding her, she nuzzled into my skin, and then practically lunged at where she knew my breast was waiting. My 31-weeker had a rooting reflex so strong she almost crawled in my arms. Absolute amazement. Unfortunately, I was not allowed to satisfy her wishes, as it would have been too physically draining for her to attempt to feed – she needed to reserve all of her strength for the simple act of growing and gaining weight. Instead, I held my little Molly for hours, until my arm went numb, my stomach complained of hunger, and my back ached from sitting so still. Sadly, I handed her back over to the nurse. By this stage, Molly had an OGT (Oro-Gastric Tube – a tube going through her mouth and down into her stomach), through which she was being fed tiny amounts of my colostrum/milk. Molly was tolerating the feedings well, and so the amounts she was being fed were slowly increasing. She had also been started on various other medications and nutrients via a drip, to make sure she stayed hydrated and to give her additional ‘growing power’, I guess. 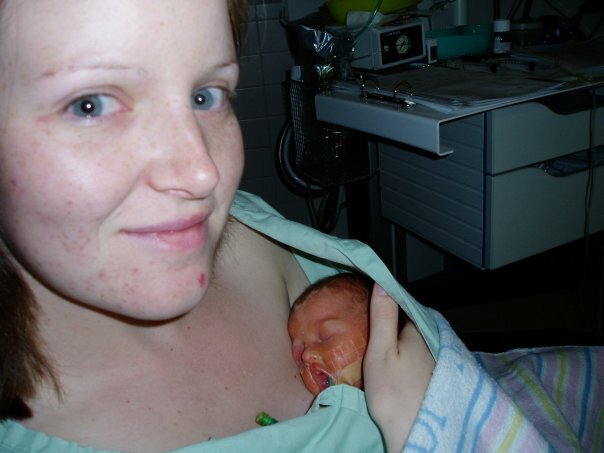 My first cuddle with her would be my only one for days, as she was placed under phototherapy lights to treat her worsening jaundice, so I was very lucky to get one when I did. We also received the news that Molly was stable enough to be transferred back to our closest hospital, and that, as soon as an appropriate bed was available, she would be moved. This was very welcome news, as day three also happened to be the day that I was abruptly discharged from the maternity ward upstairs. To put it mildly, I was a mess. I am so grateful that my Mum was with me that day (Tom was at home with Tiernan for most of it), because she helped me through one of the toughest days of my life. I couldn’t bring myself to leave my baby at the hospital. The thought of it made me feel lost inside… almost destitute. 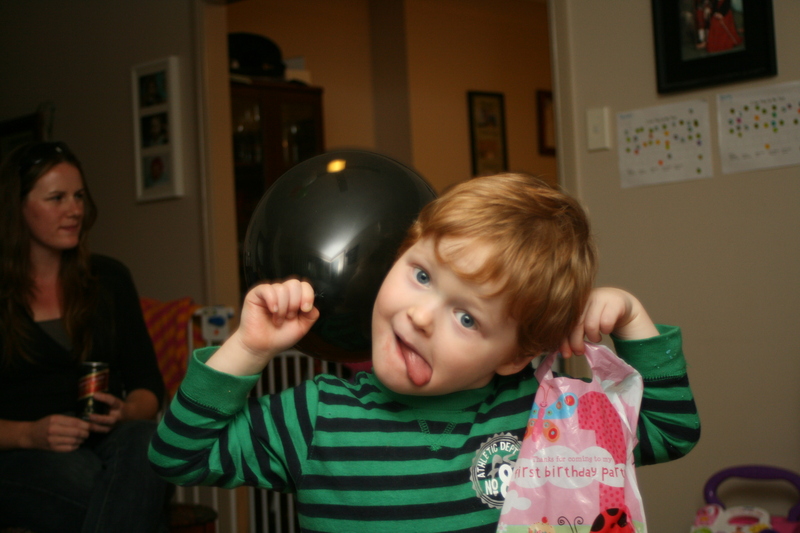 However, at the same time, I desperately missed Tiernan and wanted to be home with him, too. I was stuck, without a clue of what to do. I think the strength of my emotions on that day may be attributed, in some part, to ‘baby blues.’ I experienced it on day three with Tiernan, when my milk came in, and it was the same again with Molly. While I recognised it for what it was, it didn’t really help me to see through the fog to a solution I could live with. The attitude of the staff on the maternity ward did not help, either. They showed no regard for the trauma I was experiencing. I constantly missed meals (I was downstairs visiting my baby), and no-one bothered to hold them for me; I was treated with exasperation when I asked for more supplies of syringes, sterilising solutions and other equipment I needed to express breast milk; and when being discharged, I was rudely asked what time I would be gone by. I couldn’t believe it. Thank goodness for Mum – she got me in touch with the hospital social worker, who arranged for me to stay the night in the accommodation reserved for cancer patients who are undergoing long-term treatment. I just needed one night to clear my head and get used to the idea of leaving Molly behind. As it turned out, that one extra night also helped me to gain a little perspective on the situation. Tom, who stayed the night with me, met another mother who had a baby in the NICU. 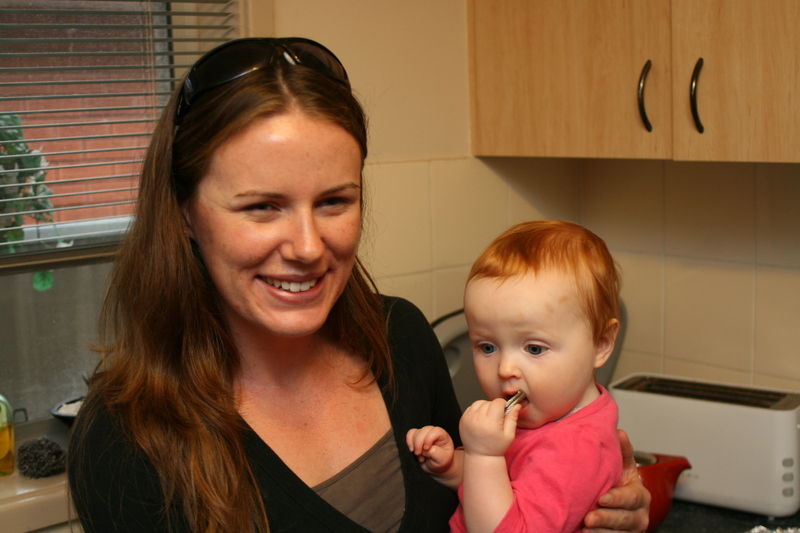 Her baby was a couple of months old, and she had been alternating fortnights spent at home in Dubbo, with her other children, and there at the hospital with her tiny baby. Talk about heart breaking. 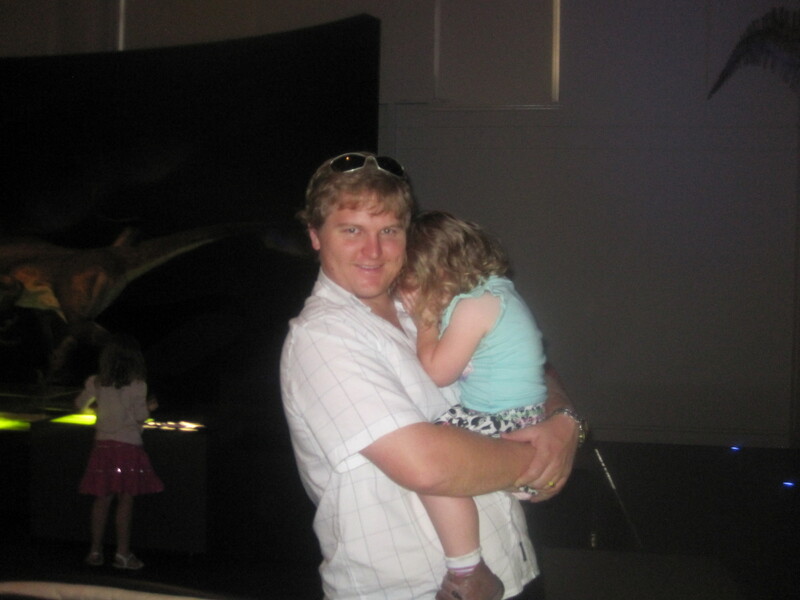 It made me realise that leaving Molly at Westmead was not the worst thing in the world – it would take an hour, at most, to travel to see her every day. It would be easy to divide my time between home and Westmead. Easy peasey, compared with a drive to Dubbo and back. By morning, I had made up my mind to go home and see Tiernan, and sleep in my own bed for the first time in almost a week. We went to visit Molly, and received the news that she was booked in for transfer to Nepean that day. It was such a relief. It seemed to make all the difference – we would be only twenty minutes away from her, we wouldn’t have to battle traffic or parking issues, and I would be able to spend time with both of my children much more easily, which was so important to me. We said goodbye to the NICU at Westmead on Molly’s fourth day, and we will be forever grateful to the wonderful doctors and nurses who saved our precious girl’s life. The NICU at Nepean Hospital was Molly’s new home for the next six weeks of her life, and it was there that we would learn more about becoming involved in her care, the many, many tests she would need to give a picture of her physical health, and more about the ups and downs of daily NICU life. Stay tuned for more! Oh Neave, I can’t believe you’re 1! You are THE most adorable 1-year-old I know. 1. I love your beautiful smile. When you smile, your whole face lights up, your nose crinkles and you sometimes even scrunch up your eyes in your very own Sailor Moon impersonation. It is heart-meltingly cute! 2. You are very interactive now, and playing with you is so much fun. You love to copy us when we clap, wave and dance. You seem to learn things very quickly, only needing to be shown a new ‘trick’ once or twice before you try it yourself. I love watching you try to figure out how things work, pressing buttons, opening and shutting things, moving toys from one container to another. 3. I love listening to you explore your voice. 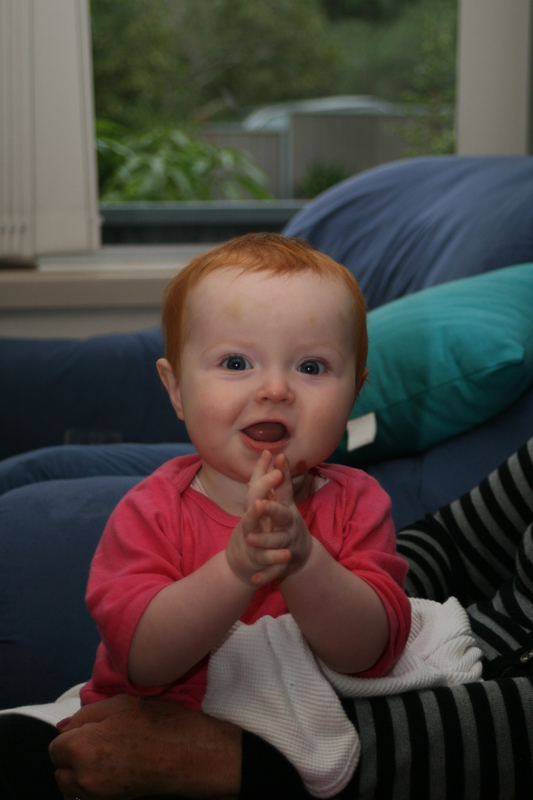 No words yet (unless you count Mama and Dada), but you love chatting away to us in your own language. Every now and then you give us a good serve for something that isn’t to your liking, but mostly your musings are reserved for expressing how content you are with life in general. 4. You are so, so close to walking! 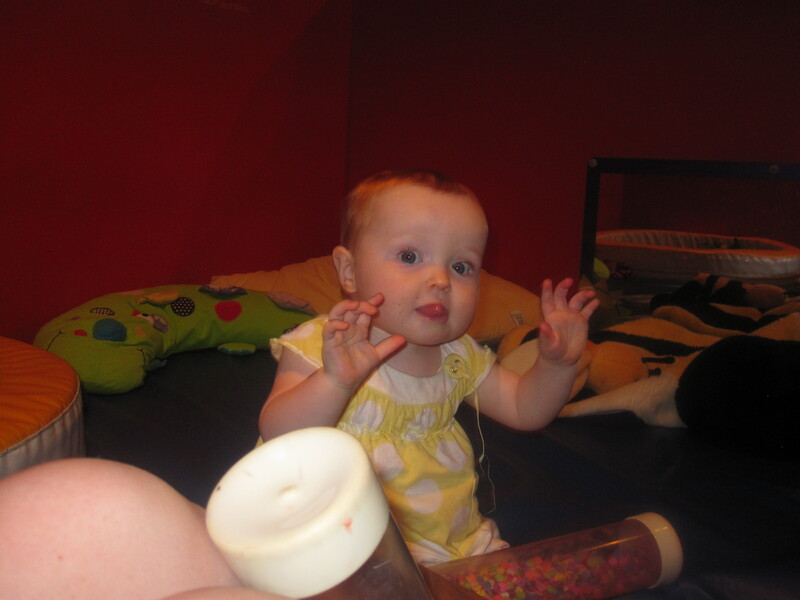 This week you have been letting go of the furniture and standing unsupported, usually whilst waving a toy around. You will walk while holding our hands now (you never used to), but as soon as we let go, you decide to sit down. Won’t be long until you’re zooming around, though! 5. You are so good at eating now. It seems like ages ago that we were having such a hard time getting you to eat anything, but now you are very happy to eat just about anything. Even with no teeth (not a single one!) you chew and swallow most foods with no trouble at all. Your favourite foods are sausages, rice cakes, bananas, carrots and baked beans. 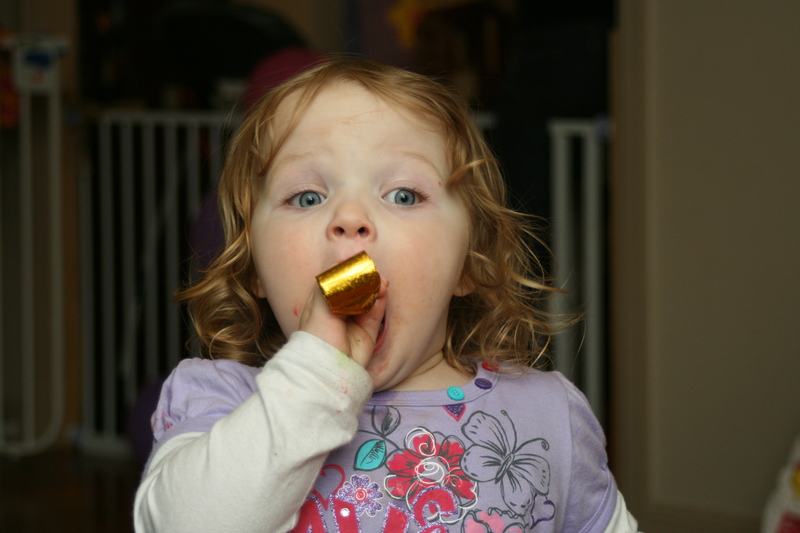 You also just had your first taste of chocolate over Easter, and you were pretty impressed. 6. I love how ticklish you are. 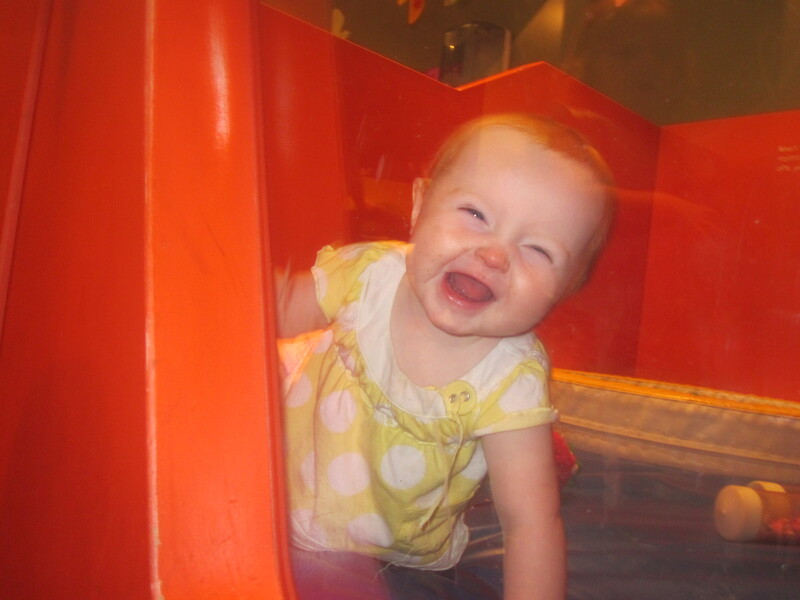 Your chuckle is infectious and you fold yourself up into a ball while you laugh. 7. You are (generally) a very content little thing. You do get a bit clingy when you are hungry or tired, but otherwise you are quite happy to just go with the flow. 8. You love your brother and sister (when they aren’t being horrible to you). I love how you watch them and interact with them. It’s especially cute to see you and Tiernan make faces and laugh at each other in the car – you can see him in the back row because you are still facing rearwards in your seat. 9. Your most favourite things in the world are your flat-teddy (made from lamb’s wool), and your blanket. You go to sleep with them every night, and you like to keep them close to you during the day, too. You also love to pounce and dive into other soft things, like cushions, couches and soft toys. It’s very funny to watch. 10. Finally, you are sleeping through the night. Hurray for night-weaning! 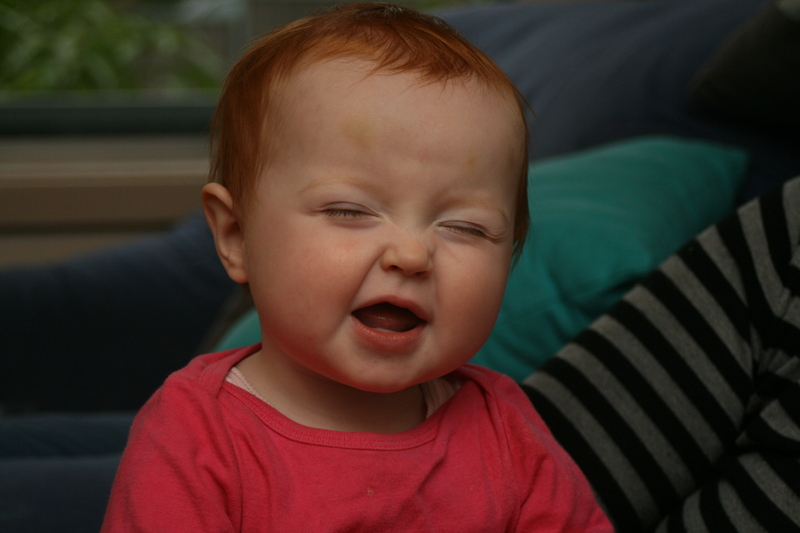 Hurray for a full-night’s sleep! 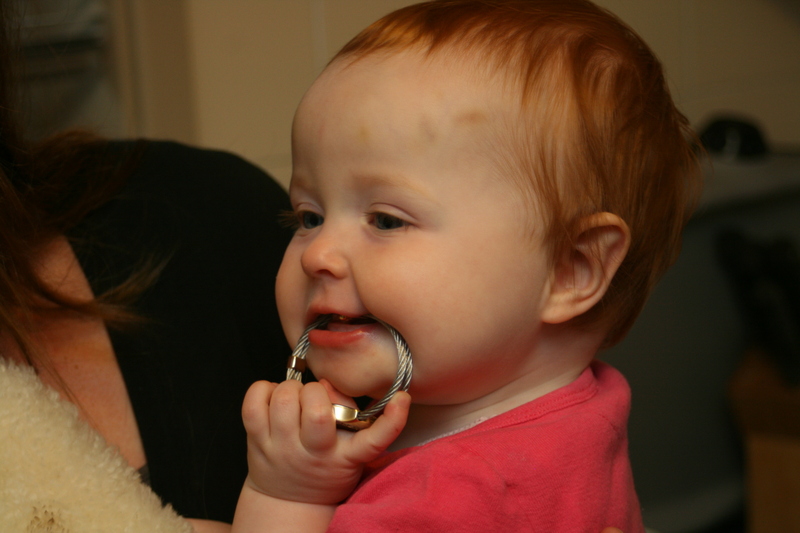 Gosh, you’re even cute when you’re putting it on! I have but one gripe. 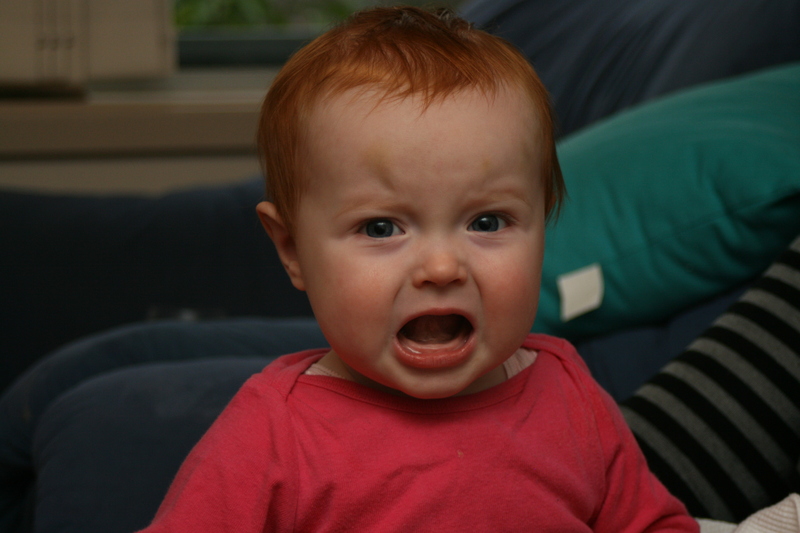 You don’t sit still in your high chair to eat – you wriggle and squirm and try to get out. You’ve even stood up and fallen out twice, which is dreadful, but you haven’t learnt your lesson and you still insist on trying to stand up. As a result, you are eating more and more of your meals on the floor these days! Some photos from the party… so annoying, I can’t find my camera battery charger anywhere. Luckily, I took a couple of pics with my phone, and one of our friends took some great shots, too. So here they are! 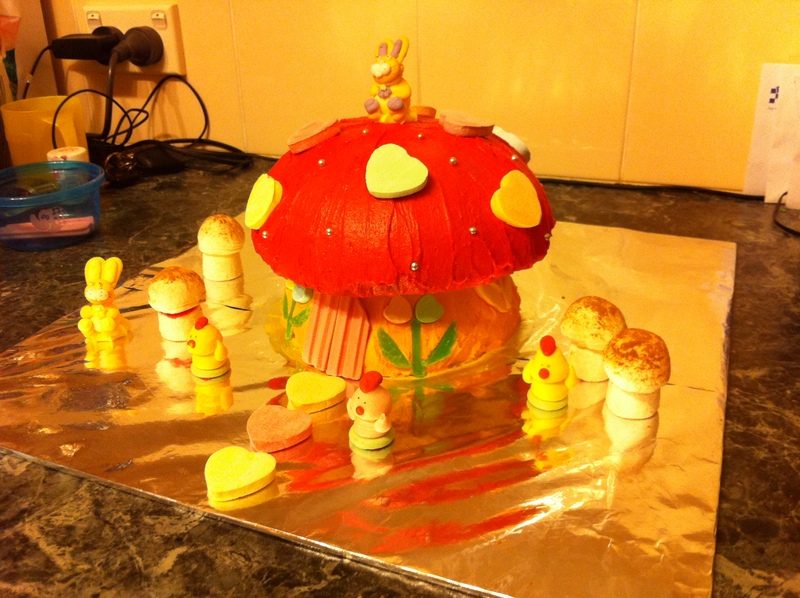 Toadstool cake (or mushroom cake, as the kids called it). 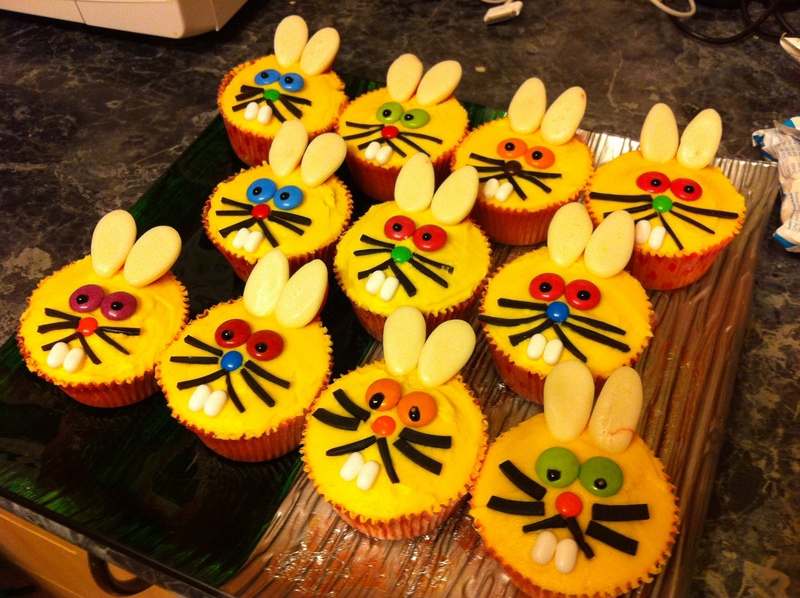 Bunnies for her day care party. The birthday girl with her Aunty Kate. Molly taking a deep breath for a big blow! Thanks for the beautiful photos, Dan! – cakes, cakes and more cakes! – sharing care of two of our nephews for a couple of days while their little brother was sick in hospital. I even attempted a playdate in the park with five kids. It went quite well, actually. – visiting a sick little bubba in hospital. (He’s okay now, back at home and recovering). So yeah, not a very productive week. Hopefully next week will be better! Anyway, I saw Tim Minchin on the Melbourne International Comedy Festival show on Channel 10, and it reminded me of those long nights spent doing exactly what he describes in the song. It was only a matter of months ago, but we have come a long way! I love Tim Minchin. Funny and incredibly talented! On the weekend, we traded a Baptism for a trip to the Museum. It felt a little bit wrong, skipping our newest nephew’s Baptism… but he and his brothers were sick with gastro, and so we were let off. The Baptism went ahead, in the freezing-cold climes of Oberon, while we headed in the opposite direction, to the city, on a perfect autumn day. Lovely! We headed to the Australian Museum to see their new Birds of Paradise exhibit (which I forgot to take photos of, oops). 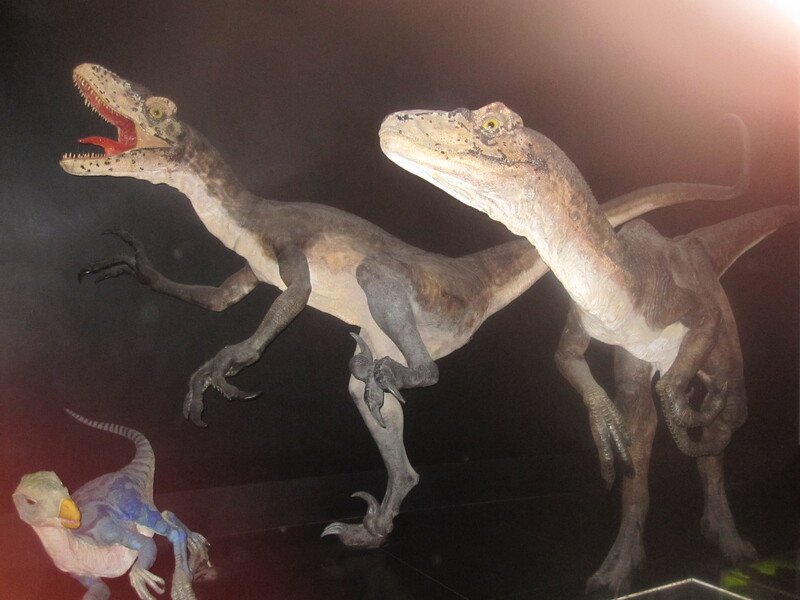 And to see dinosaurs, of course – Tiernan’s second love, after trains. Molly pretends to like dinosaurs as much as Tiernan, but as soon as she remembers that they do scary things like stomp and roar, she abruptly decides they’re not so much fun. One time she was dancing away to the ‘Dino Stomp’ on Playschool. She was having a great time until she realised the song was about dinosaurs, at which point she ran away from the TV, claiming it was too scary. So we weren’t really sure how a trip to see dinosaurs would go down with Molly. The Australian Museum is an impressively huge building (well, there are dinosaurs inside), located near Hyde Park, in Sydney. It stands opposite St Marys Cathedral (a beautiful, but slightly guilty reminder of where we were supposed to be…) Maybe we’re just hopeless, but it took us ages to work out how to get into the impressively huge building, and even then we were on the wrong floor! When we eventually found our way to the foyer, Tom paid for our tickets and I kept the kids entertained by showing them what I, naively, thought was a model of a wombat. A very realistic looking wombat… Oh crap, it’s an actual stuffed wombat. 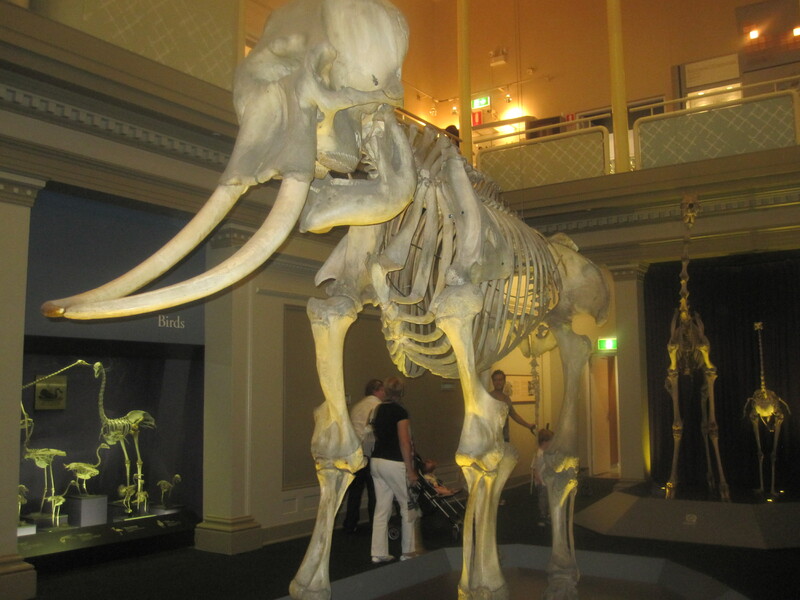 Who’d have thought the museum would be full of dead things??? (So here’s where admit that, while I’m trying to sound all cultured, like taking my tiny kids to the museum is a regular thing we do, it’s actually been a reeeeeaaaally long time since I’ve been to one… in fact I don’t remember ever going to one). The kids noticed the wombat was real before I even did, and refused to touch it. Wasn’t quite prepared for that one. Molly: “Okay!” Starts patting the wombat. 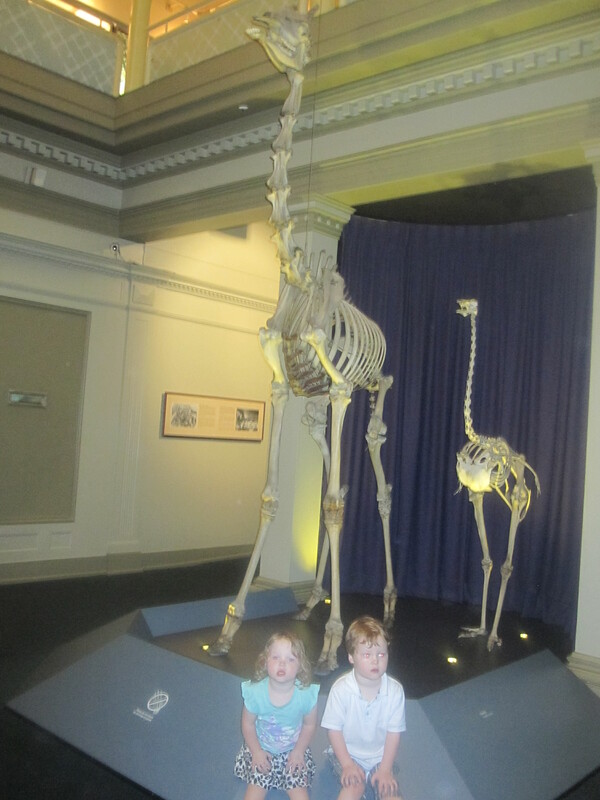 The skeleton room was a huge favourite, with all of us. For some reason, I’ve always been fascinated with skeletons. They’re really cool. 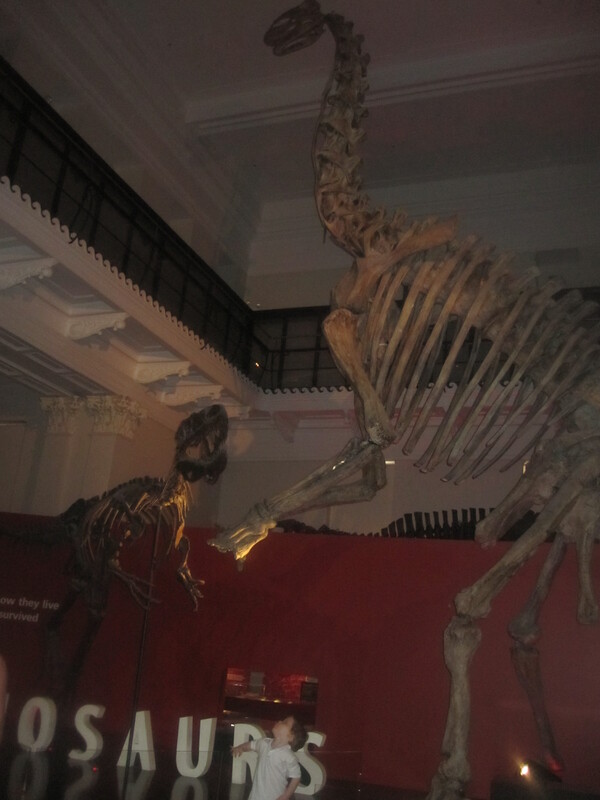 I’m not the most observant person… I originally captioned the above photo ‘Giraffe skeletons’. Until I counted the legs on the ‘baby giraffe’. Oops, no wonder the kids were so confused! We all had a great time playing in the kid’s area of the museum. 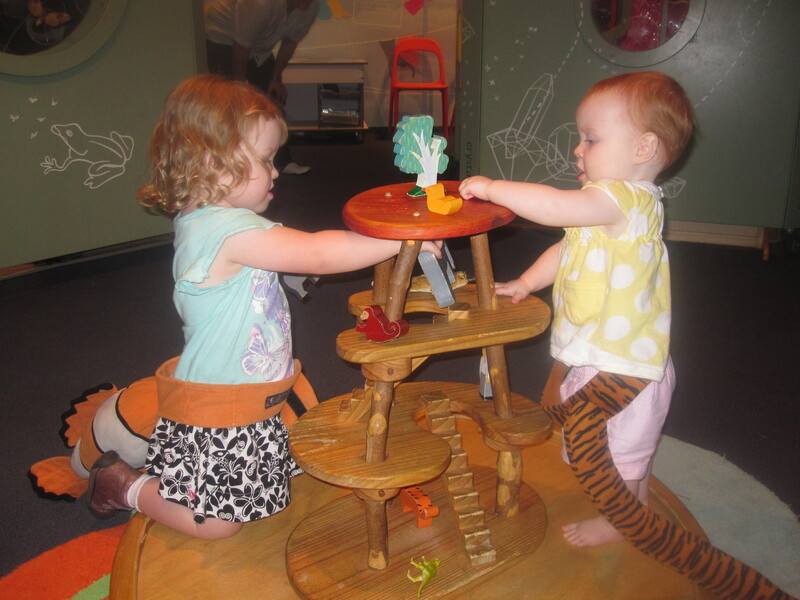 It had lots of little set-ups with insects, dinosaurs, animals and even dress-ups for them to play with. 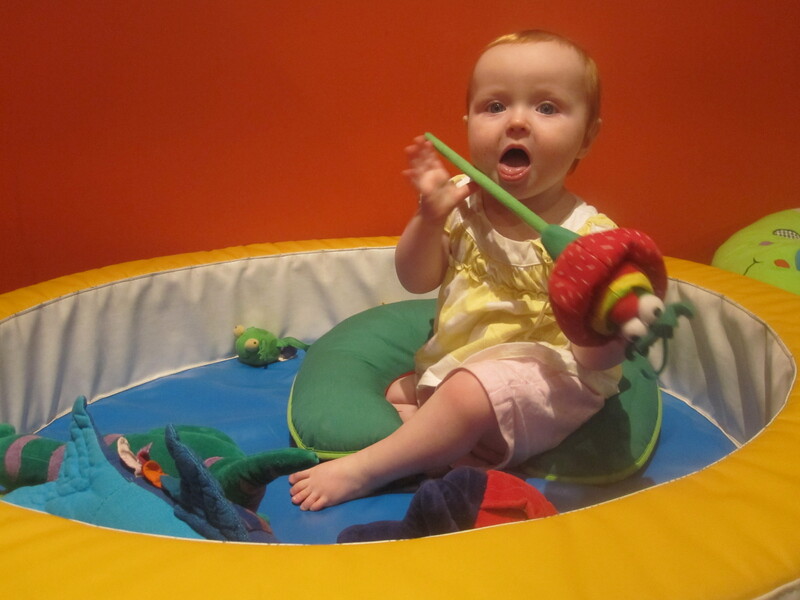 Neave loved the ‘padded room’ (baby play-pen), too – her favourite thing to do is dive and roll around on soft things, so this was perfect for her. I want one. 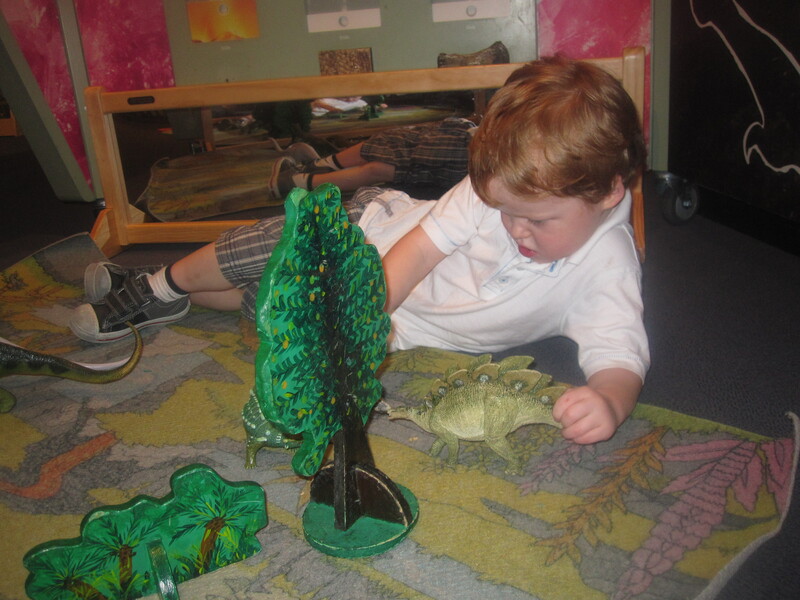 He enjoyed these dinosaurs so much he didn't want to go and see the big ones! When we finally managed to drag the three of them away from this super cool place, we got to the dinosaurs. Hurrah! I had been really looking forward to this – I went through the same dinosaur-loving phase that Tom went through as a kid. When I was about seven, I was fascinated with them. I had a few toys and some books, and I spent ages trying to memorise their names so that I would sound clever if anyone asked me how many dinosaurs I could name (which I desperately hoped they would). My brain has since deleted this useless information, so I can only name six now: Triceratops, Tyrannosaurus Rex, Stegosaurus, Ankylosaurus, Brontosaurus, Brachiosaurus. I think that’s more than Tom can name, so I’m happy. It was a little much for Molly, at first, especially with the intermittent roaring… but she got used to it and quite enjoyed herself. 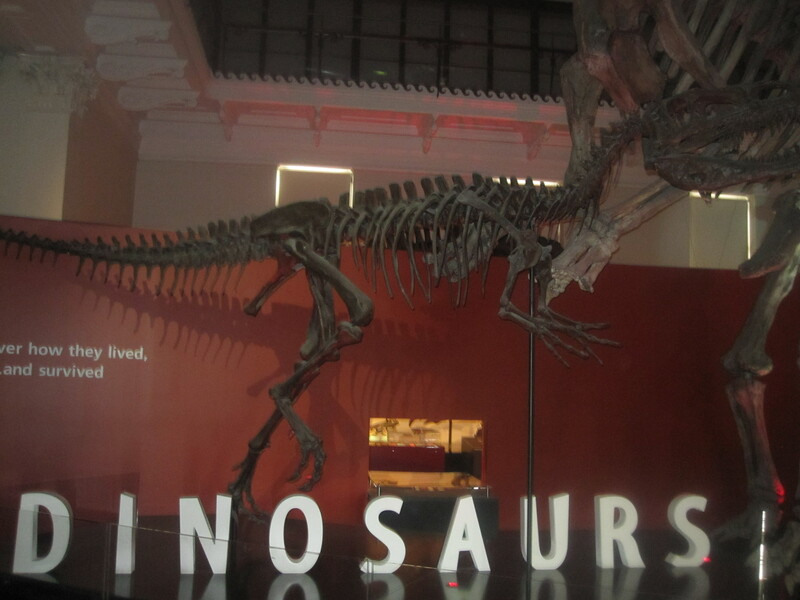 It turns out that, while I can name a few dinosaurs, I’m not so good at actually matching names with the real thing. 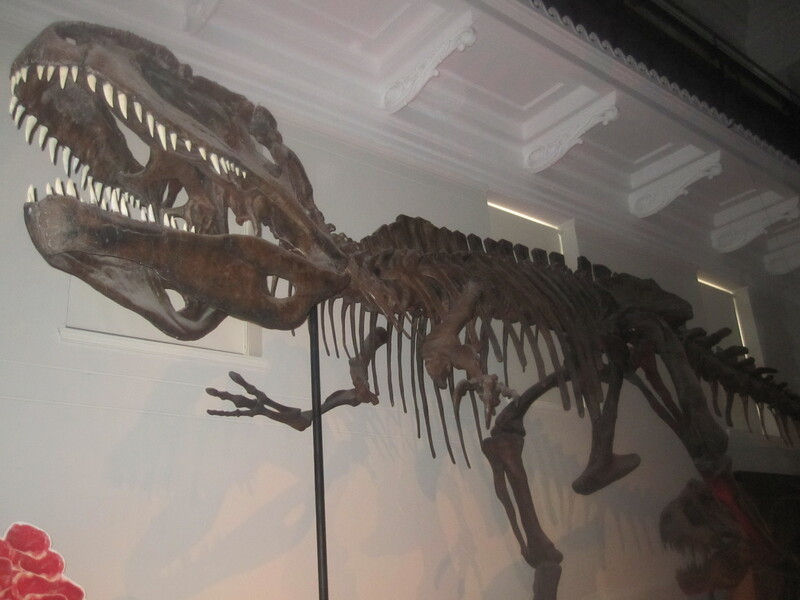 “Ooh, Tiernan – look at the Tyrannosaurus! Can you say that? Ty-rann-o-saur-us. Very good! Oh hang on, it’s a Gigantosaurus… never mind. What’s that one? I think it’s a Brachiosaurus, Molly. Wait, no, it’s not a Brachiosaurus, it’s a… something-or-other (insert unpronounceable dino name here). Hmm.” So at least we all learnt something, anyway.